What is radio frequency ? 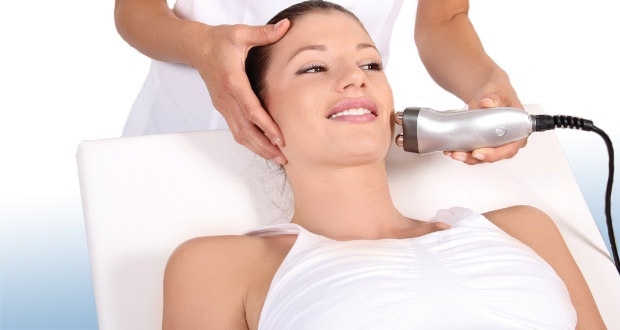 Radiofrequency has become a standard process of non-invasive aesthetic medicine. The bipolar radio frequency generates an electromagnetic field, which varies from positive to negative, causing a rotational movement of the water molecules contained in the tissues. This process produces endogenous heat (which originates inside a body). The heat produced will act in depth, without burning the surface, ie the skin. It is possible to heat up to 55 ° C. in depth, which will stimulate the fibroblasts and produces new fibers of elastin and collagen. 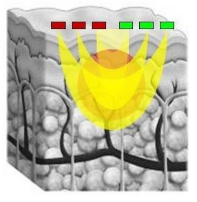 At the same time, the heat induces the retraction of the pre-existing collagen fibers. This type of treatment is a perfect system to restore tone, firmness and softness to the skin. It is a great help for skin imperfections, wrinkles and cellulite. 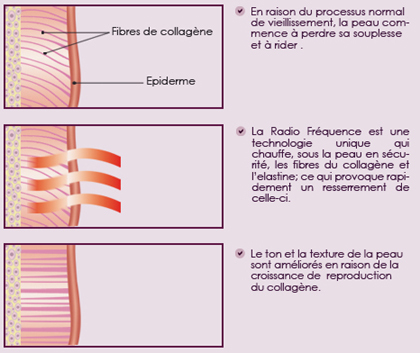 What are the effects of radiofrequency ? Lymphatic drainage, which helps to reduce the fluids and toxins in which the adipocytes (cells specialized in the storage of fat) of cellulite affected tissue are imprisoned. An increase in micro-circulation in the area that helps to improve the metabolism of adipose tissue, subcutaneous tissue, as well as the appearance of the accompanying skin. The new collagen formation , both in the skin and the subcutaneous tissues, allowing the whole structure to acquire firmness thanks to the reorganization of the fibrous septum and the thickening of the adjacent skin. This revolutionary technique treats the skin deeply, and stimulates the production of new collagen that improves firmness and cutaneous tension. The reversal effect is immediate , giving a strong shine visible and a stronger of the skin . The retraction then continues over time. What are the advantages of radiofrequency ? Radiofrequency is aimed at anyone who wishes to fight against the aging of the skin and to slow down the signs of the time. This treatment is not suited if you have a pacemaker, metal implants or if you are pregnant. Similarly, do not start a session if your skin is irritated, if it has severe couperosis or dermatoses. How does a RadioFrequency session work ? In the weeks following application, the stimulation of collagen continues. Gradually, the treated area strengthens, your wrinkles fade bringing a new youth to your skin.